It can be nice to have the kids home for a few weeks to spend some quality family time together but after a few days at home they tend to go a bit stir crazy! Theres only so many times you can take a trip to the movies before youve seen it all, twice Here are a few other ideas of how to entertain the troop on the Gold Coast. The Gold Coast is famous for its amazing theme parks. With 5 different options to choose from including movie world, sea world, wet n wild, dream world and white water world, there is sure to be something the whole family will love. Taking the kids to the theme parks will definitely make these school holidays one to remember! Right in the heart of the vibrant Surfers Paradise, Infinity is can be found in the Chevron Renaissance Centre on Surfers Paradise Boulevard. This exciting attraction is the ultimate thing to do and has been dubbed a theme park in itself. With a whole heap of different experiences inside Infinity will blow your mind! Illusions, special effects and hilarious activities will transport you to a whole other world! Southport is home to an awesome aqua park. 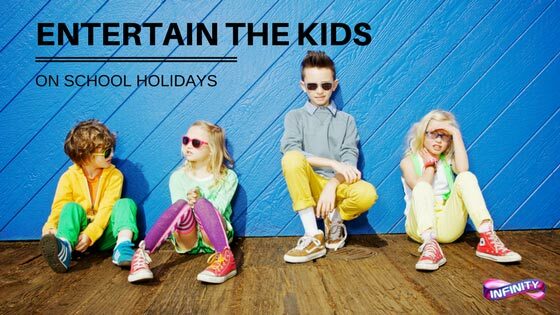 The kids will wear themselves out jumping to and from various floating activities like slides and trampolines! This place is literally a floating fun park and the perfect way to cool off on a hot Gold Coast day. The wildlife sanctuary is a much-loved Gold Coast attraction. The remarkable animals and entertainment here will amaze you. If animals arent really your thing theres always the tree top challenge. Chuck on a harness before you climb and zip line your way through challenging rope courses. Its certainly one way to get the blood pumping! Do your kids know how to surf? Why not get them a surf lesson! Its a whole new fun experience and theres no better place to do it then one of our beautiful Gold Coast beaches. Here they will also learn the important life skills of how to stay safe in the ocean! This is such a great way to keep them active and out of the house. If you are looking for a good night activity, Night Quarter is it! Based in Helensvale, the buzzing night market boasts a smorgasbord of food stands accompanied by live entertainment. The buzzing environment is like nothing else! The kids will be loving you as they realise they can easily choose to eat whatever they are in the mood for. Dinner is done!